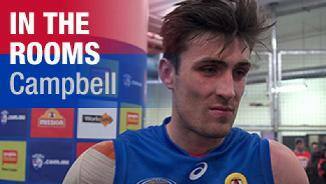 westernbulldogs.com.au reviews Tom Campbell's 2017 season. 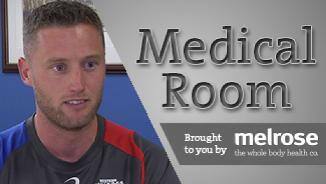 Tom Campbell answers some quick fire questions for the AFL Record. Stats from all AFL-listed players from Friday's win over Essendon. Campbell is a big bodied ruckman who has also shown promising signs in the forward line in recent seasons. Recruited from Bendigo Bombers through the rookie list in 2011, Campbell made his debut in round 13 of 2012 and went on to receive the Williamstown Best Player Award that year. 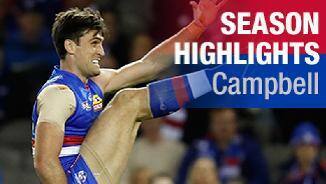 Campbell is a two-time VFL premiership player, having been a part of both the Footscray Bulldogs' 2014 and 2016 flag victories. An injury interrupted season for Tom Campbell limited the ruckman to seven senior matches in 2017. Campbell’s best performances came against North Melbourne in Round 14 (where he recorded 49 hitouts and kicked a goal) and in Round 15 against West Coast, where he dominated the ruck contest with 47 hitouts. An abdominal injury sustained in the Round 15 loss to the Eagles restricted the big man from playing many senior games thereafter. He returned in the VFL against Essendon and earned an AFL recall for the final home-and-away game of the season against Hawthorn. Battled well in the air and at ground level in Round 14 against North Melbourne, finishing with 49 hit-outs and a goal. Promising ruckman Tom Campbell was one of the standouts of the pre-season before a foot injury suffered in the NAB Cup stifled his aspirations for a round one start. He returned to string together nine games between rounds 5-13, forming a formidable tandem with Jordan Roughead before injury struck again, sidelining him for much of the second half of the season. Campbell again fought back to play a major role in Footscray’s 2016 premiership tilt, named among the best in the ‘Scray’s final two games of the season. Signed a two-year contract extension late in the season which will see him remain at the Club until at least the end of 2018. Despite injuries, recorded career highs in multiple categories, including games played, average disposals, contested possessions and score involvements. “I started the season really well, had a great pre-season, but I hurt my foot a couple of times which derailed my campaign a little bit, but I got back to play some good footy and we won the VFL Grand Final, so that was fantastic. After shoulder surgery in the summer, the ruckman had an interrupted pre-season assault. Campbell plied his trade in the VFL for much of the year, with the Club trying several different ruck combinations throughout the year. The 23-year-old eventually got his chance in round 16 and made the most of his opportunity. Campbell spent rounds 16 to 21 in the senior side, before succumbing to a thigh injury ahead of round 22. Despite limited opportunity at AFL level, Campbell proved he can be a competitor in the ruck while providing value around the ground, and will be eager for more chances in 2016. Campbell hit a career-high 32 hitouts in round 16 against Geelong. Although only playing seven senior games, Tom Campbell capped off a consistent year in the VFL finishing third in the J.J. Liston Trophy with 15 votes. So good was his year, he was ahead of the count at the end of round 15, but did not play another game after being elevated to the senior side for the final five games of the AFL season. After two games throughout the year, Campbell got his chance again at AFL level in round 19 and quite literally grabbed it with both hands. Campbell took three contested marks inside 50 and kicked two goals, cementing his spot in the side for the remainder of the season. Campbell led the VFL best and fairest count after round 15, before returning to the AFL side for the remainder of the season. “I’ve been working really hard in the VFL for the last few months, the messaging to me has been really clear about what I need to do and to kick a couple of goals was really good.” – Tom Campbell following his return to the senior side in round 19. The developing tall spent most of 2013 with VFL affiliate Williamstown before playing an important role in the Club’s last five matches. After coming in as an emergency in round three, Campbell returned in round 19 against Sydney to boot the first two goals of the game and maintained that momentum until season’s end. A heavy collision with the goalpost against Carlton in round 20 couldn’t stop Campbell on his way to three tackles and a goal, while his four goals against Adelaide the following week signalled a career best display. The big man contested strongly up forward and had effective stints in the ruck. While Campbell has long been groomed as a highly capable tap ruckman, his emerging confidence in the forward line this season was impressive. The 22-year-old had a total of 47 disposals this season and 22 of those had a direct impact on the scoreboard (nine goals, seven behinds and six goal assists). Shouldering first ruck duties for Williamstown for the first half of the season, Tom Campbell was dominant - named amongst the best players in eight of his ten VFL games. 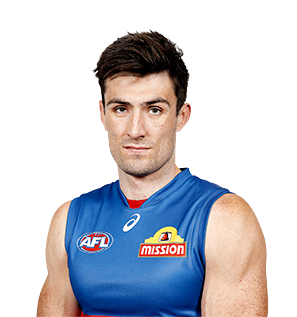 Elevated to the senior list to debut against Brisbane Lions in round 13, the 20-year old was thrown in the deep end assuming the first ruck post with Will Minson restricted to the sidelines. Going head to head with ex-Bulldog Ben Hudson, Campbell effectively won the duel with the Dogs taking bragging rights in the ruck. He went on to play a further six games in his debut year. Powerful ruckman Tom Campbell was considered one of the premier VFL ruckman in 201. Turning 21 next year, Campbell has a more developed body capable of competing with the bigger bodies at AFL level.